Kenneth Acker falls down after intercepting a Denver pass, the third of the game by Kansas City. KANSAS CITY, Mo. — The sight was oh-so-familiar to Chiefs fans: That familiar speed of Jamaal Charles hitting the hole, the talent that made him one of the NFL’s best running backs during nearly a decade in Kansas City. When he coughed up the ball Monday night, it was another familiar sight. Not that Charles fumbled, though he had his share of those over the years. But that the Chiefs’ underperforming defense, which had been among the best in the NFL at taking the ball away the past couple of years, had finally produced a turnover in a crucial spot. 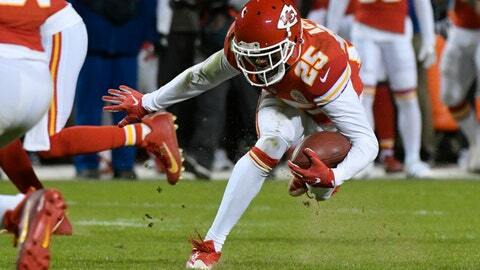 The fact that Marcus Peters picked up his strip of Charles, the first of five forced turnovers, and ran 45 yards for a touchdown to open their 29-19 victory simply made it that much better. The problem with the Chiefs lately hasn’t been scoring off turnovers, though. It’s been getting turnovers at all. They rolled into their Monday night showdown with Denver with just five interceptions and two fumble recoveries through their first seven games. Their total of 13 takeaways was tied for 25th in the league, a number that is hardly acceptable for a defense predicated on making big plays. You see, the Chiefs don’t stonewall opponents like the Broncos. They give up yards in chunks, content to know that their playmakers will often force a turnover when their backs are against the wall. So compare their totals this season to last season, when the Chiefs led the NFL with 18 picks, 15 fumble recoveries and 33 total takeaways. Or to the previous year, when their 22 interceptions was second and their 29 total takeaways placed them firmly in the top five of that crucial category. It made Monday night feel like a throwback in Kansas City. The Chiefs didn’t force any turnovers the previous week against the Raiders, when they allowed Derek Carr to torch them for 417 yards passing and three touchdowns in a last-second, 31-30 loss. They forced only one the previous week in a 19-13 loss to the Steelers. Chiefs coach Andy Reid said producing turnovers wasn’t a particular emphasis during the extra time between their Thursday night game in Oakland and their Monday night game against Denver. Rather, it’s a point of emphasis every day in practice — stripping ball-carriers and picking off passes. Now, the Chiefs were helped out by an impotent Broncos offense and poor special teams. The first interception thrown by Trevor Siemian looked as if his target the entire time was Peters, who broke on a post route for an easy pick. The second was a downfield heave that safety Ron Parker was able to leap up and grab. And the final interception by Kenneth Acker was an egregiously poor cross-body throw toward the middle of the field that was nowhere near a Denver receiver. The Broncos’ second fumble came when rookie return man Isaiah McKenzie dropped a punt and the Chiefs jumped on it deep in Denver territory. Kansas City turned it into a field goal moments later. Still, the Chiefs were opportunistic enough to take advantage of the Broncos’ gifts, and the result was a fourth straight victory over their AFC West rival and now a stranglehold on the division.